This article is about the core district in Beijing. For other places with the same name, see Chaoyang. 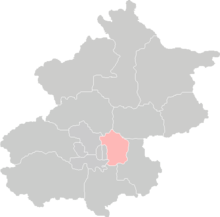 Chaoyang District (simplified Chinese: 朝阳区; traditional Chinese: 朝陽區; pinyin: Cháoyáng Qū; literally: 'facing the sun') is a core district of Beijing. It borders the districts of Shunyi to the northeast, Tongzhou to the east and southeast, Daxing to the south, Fengtai to the southwest, Dongcheng, Xicheng and Haidian to the west, and Changping to the northwest. Chaoyang is home to the majority of Beijing's many foreign embassies, the well-known Sanlitun bar street, as well as Beijing's growing central business district. The Olympic Green, built for the 2008 Summer Olympics, is also in Chaoyang. Chaoyang extends west to Chaoyangmen on the eastern 2nd Ring Road, and nearly as far east as the Ximazhuang toll station on the Jingtong Expressway. Within the urban area of Beijing, it occupies 475 square kilometres (183 sq mi), making it the central city's largest district, with Haidian second. As of 2005, Chaoyang had a total population of 3,642,000, making it the most populous district in Beijing. The district has jurisdiction over 22 subdistrict offices and 20 area offices. Chaoyang is also home to Silk Street, and many other market areas, shopping malls, and restaurant strips. The Ministry of Foreign Affairs and the Ministry of Culture are headquartered in the district. In 2017,the regional GDP of the district is 563.55 billion yuan, with GDP per capita at 150.7 thousand yuan. China National Aviation Holdings Company (parent company of Air China), SOHO China, CITIC Group, Sinopec, Qihoo 360, and Beijing Capital Airlines have their headquarters in Chaoyang District. Renren Inc. has its headquarters on the 23rd floor of the Jing An Center (S: 静安中心, T: 靜安中心, P: Jìng'ān Zhōngxīn) in Chaoyang District. Wanda Group has its headquarters in the Wanda Plaza (万达广场). Wanda Cinemas is headquartered in the same complex. China Resources Beverage, the distributor of C'estbon water, has its north China regional office in the district. ABB Group (China headquarters), Air France, All Nippon Airways, (Beijing Office, Beijing Fortune Building) Halliburton, IBM, KBR, Kerr-McGee China Petroleum Ltd. (Anadarko Petroleum Corporation subsidiary), Korean Air (Hyundai Motor Tower (现代汽车大厦 Xiàndài qìchē dàshà)), Kroll Inc., Lummus Technology, a subsidiary of CB&I, Lufthansa (Beijing Lufthansa Center), Asiana Airlines, Standard & Poor's, Swire Group, Etihad Airways, EVA Air, and Qatar Airways. The Hong Kong-based company Swire Properties has two locations in Chaoyang. Beijing Hyundai Motor Company (BHMC, Chinese: S: 北京现代汽车有限公司, T: 北京現代汽車有限公司, P: Běijīng Xiàndài Qìchē Yǒuxiàngōngsī, Korean: 북경현대), a 50–50 joint venture of the Beijing Automotive Industry Holding Co. and Hyundai Motor Company, has its sales offices in the Hyundai Motor Tower in Chaoyang District. Chaoyang serves as Beijing's diplomatic district. All foreign embassies to China are located in the district except for those of Russia and Luxembourg, which are both in Dongcheng. Chaoyang has three embassy areas in the Sanlitun, Chaoyangmenwai, and Liangmahe neighborhoods. Chaoyang District is one of the fastest growing districts in the Beijing Metropolitan Area. There are several subway lines running through the district. The Beijing Capital Airport, although surrounded by the Shunyi District, is an exclave of Chaoyang District. The municipality as well as the Chinese national government spend almost a half million USD per day on developing this district. ^ 2011年统计用区划代码和城乡划分代码：朝阳区 (in Chinese). National Bureau of Statistics of the People's Republic of China. Archived from the original on 2012-10-31. Retrieved 2013-02-23. ^ Home. Ministry of Foreign Affairs of the People's Republic of China. Retrieved on October 27, 2010. "Contact us Address: No. 2, Chaoyangmen Nandajie, Chaoyang District, Beijing, 100701 Tel:86-10-65961114." ^ Home Archived December 6, 2010, at the Wayback Machine. Ministry of Culture of the People's Republic of China. Retrieved on December 22, 2010. "Contact us Address: No.10, Chaoyangmen Beidajie, Chaoyang District, Beijing,100020 Tel:86-10-59881114"
^ "Connect Us." China National Aviation Holdings Company. Retrieved on December 19, 2011. "Address: 25-28/F,Air China Plaza,No.36 Xiaoyun Road,Chaoyang District,Beijing"
^ "Contact Us Archived 2012-04-20 at the Wayback Machine." SOHO. Retrieved on August 23, 2012. "11F, Building A, Chaowai SOHO 6B Chaowai Street, Chaoyang District Beijing 100020, China" – Chinese address Archived 2012-08-20 at the Wayback Machine: "地址：北京市朝阳区朝外大街乙6号朝外SOHO A区11层"
^ "Contact Us Archived September 27, 2011, at the Wayback Machine." CITIC Group. Retrieved on August 13, 2011. "Address: Chaoyang District, Beijing Xin Yuan Nan Road Building in Beijing on the 6th"
^ "Welcome to Sinopec." Sinopec. Retrieved on July 8, 2010. "Address: 22 Chaoyangmen North Street, Chaoyang District,Beijing"
^ "Contact Us." Qihoo 360. Retrieved on May 11, 2016. "Address :Building #2, No. 6 Jiuxianqiao Road, Chaoyang District, Beijing 100015, China"
^ "联系方式 Archived 2012-08-01 at the Wayback Machine." Beijing Capital Airlines. Retrieved on August 26, 2012. "北京首都国际机场货运北路3号首都航空大厦"
^ "Contact Us." Renren Corporate. Retrieved on November 19, 2012. "Renren Inc. Beijing Headquarter 23/F, Jing An Center No.8 North Third Ring Road East Chao Yang District, Beijing" – Chinese: "北京市朝阳区北三环东路8号静安中心23层"
^ "Contact Archived 2015-01-09 at the Wayback Machine." Wanda Group. Retrieved on January 4, 2015. "Headquarters Address:Tower B, Wanda Plaza, No. 93 Jianguo Road, Chaoyang District, Beijing" – Chinese address Archived 2015-01-05 at the Wayback Machine: "北京市朝阳区建国路93号万达广场B座"
^ "联系我们 Archived 2015-01-03 at the Wayback Machine." Wanda Cinemas. Retrieved on January 3, 2015. "公司地址：北京市朝阳区建国路93号 万达广场B座11层"
^ "Contact 联系我们 Archived 2014-04-13 at the Wayback Machine." China Resources Beverage. Retrieved on April 10, 2014. "华北分公司 地址： 北京市朝阳区朝阳路高井财满街2期8号楼1单元1101号"
^ a b "A Sketch of Chaoyang." Chaoyang District. Retrieved on October 27, 2010. ^ "Beijing (10 Jiuxianqiao Road)." ABB Group. Retrieved on February 6, 2009. ^ "Addresses in China." ABB Group. Retrieved on February 6, 2009. ^ "Contact us." Air France China. Retrieved on June 27, 2010. ^ "ANA City offices Asia." All Nippon Airways. Retrieved on 13 August 2011. "2nd floor Beijing Fortune Bldg., N200, No.5 Dong San Huan Bei Lu, Chao Yang District, Beijing 100004"
^ "Office Location" Halliburton. Retrieved on January 13, 2009. ^ "IBM China." IBM. Retrieved on October 21, 2009. ^ "Locations." KBR. Retrieved on December 26, 2010. "Kellogg China, Inc. Beijing Liaison Office Unit D Floor 7 Tower A of Gateway Plaza No. 18 Xianguangli, Dangsanhuan Beilu Chao Yang District, P.R. China"
^ "Office locations." Anadarko Petrolueum Corporation. Retrieved on August 14, 2009. ^ "公司资料 / 联系信息." Korean Air. Retrieved on August 30, 2011. "China Headquarters Unit 1, 9th Floor, Hyundai Motor Tower No 38, Xiao Yun Road, Chao Yang District, Beijing" – Address in Chinese: "中国总部	北京市朝阳区霄云路38号现代汽车大厦"
^ "Office locations Archived 2011-08-10 at the Wayback Machine." Kroll Inc. Retrieved on 14 August 2011. "Beijing Unit 805, Tower 1 China Central Place, No. 81 Jianguo Lu, Chaoyang District Beijing 100025 China"
^ "Worldwide Offices Archived January 22, 2009, at the Wayback Machine." CB&I. Retrieved on January 13, 2009. ^ "City office information." Lufthansa. Retrieved on February 6, 2009. ^ "Worldwide Offices China." Asiana Airlines. Retrieved on January 19, 2009. ^ "Office Locations Asia." Beijing Suite 1601, 16/F Tower D, Beijing CITC A6 Jianguo Menwai Avenue Chaoyang District, Beijing 100022 "
^ "Contact Information JOHN SWIRE & SONS OFFICES." Swire Group. Retrieved on September 12, 2011. "John Swire & Sons (China) Ltd. Room 1706, Capital Mansion 6 Xin Yuan Nan Road Chao Yang District Beijing 100004 China"
^ "Our offices Archived 2013-02-13 at the Wayback Machine." Etihad Airways. Retrieved on February 6, 2009. ^ "Contact Us Asia Archived February 4, 2009, at the Wayback Machine." EVA Air. Retrieved on February 6, 2009. ^ "Beijing Archived 2009-02-27 at the Wayback Machine." Qatar Airways. Retrieved on February 9, 2009. ^ "Contact Us." Swire Properties. Retrieved on 12 September 2011. "Address 10/F, Zhong Yu Plaza, No. 6A Gongtibei Road, Chaoyang District, Beijing" and "Address 18 Jiuxianqiao Road, Chaoyang District, Beijing"
^ "联系我们." (Archive, Image, Archive, Image 2, Archive) Beijing Hyundai Motor Company. Retrieved on October 20, 2012. "销售本部地址: 北京市朝阳区霄云路38号现代汽车大厦6层"
^ "Home." Beijing BISS International School. Retrieved on June 19, 2013. "No. 17, Area 4, Zhen Xi Li, Chaoyang District, Beijing 1000029,People's Republic of China"
^ "Contact Us Archived 2013-09-27 at the Wayback Machine." Yew Chung International School of Beijing. Retrieved on July 19, 2013. "Honglingjin Park, 5 Houbalizhuang, Chaoyang District, Beijing 100025, P.R.C. 中国北京市朝阳区后八里庄5号红领巾公园 100025"
^ "ホームページ Archived 2013-01-10 at the Wayback Machine." Japanese School of Beijing. Retrieved on November 10, 2012. "北京市朝陽区将台西路6号"
^ "Welcome to Korean International School in Beijing" (Archive) Korean International School in Beijing. Retrieved on January 25, 2014. ^ "Contact & Visitor Info." Dulwich College Beijing. Retrieved on June 20, 2013. "Riviera Main Campus 1 – 6 year olds 1 Xiang Jiang Bei Lu Jing Shun Lu Chao Yang District Beijing 100103 PRC 北京德威英国国际学校 北京市朝阳区京顺路香江北路1号香江花园 邮编：100103"
^ a b c d e f g h "I want information on basic education." City of Beijing International website. Retrieved on November 10, 2012. "Japanese School of Beijing Add: 6 Jiangtai Xilu, Chaoyang District"
^ Home page. Deutsche Botschaftsschule Peking. Retrieved on 17 January 2015. "Liangmaqiao Lu 49A – Chaoyang Bezirk, 100125 Peking – Volksrepublik China "
^ "Contact Us." Pakistan Embassy College Beijing. Retrieved on September 16, 2015. " Pakistan Embassy College Beijing Embassy of Pakistan Compound No. 1, Dong Zhi Men Wai Da Jie, Sanlitun, Chaoyang Distt. Beijing 100600, CHINA." ^ "Sanlitun Campus Archived June 18, 2013, at the Wayback Machine." The British School of Beijing. Retrieved on June 20, 2013. "Sanlitun Campus: 5 Xiliujie, Sanlitun Road Chaoyang District Beijing 100027, China 北京英国学校(三里屯小学部)：中国北京市朝阳区三里屯西六街5号, 邮编：100027" and "Sanlitun Early Years Campus: No.7 Beixiaojie, Sanlitun Road, Chaoyang District, Beijing 100027, China"
^ " "Archived copy". Archived from the original on 2014-01-06. Retrieved 2014-01-05. CS1 maint: Archived copy as title (link)." Star Education Beijing. Retrieved on January 5, 2014. "北京市朝阳区慈云寺桥东南角住邦2000大厦一号楼A座801"
Wikivoyage has a travel guide for Chaoyang District, Beijing. Wikimedia Commons has media related to Chaoyang District, Beijing. This page was last edited on 30 March 2019, at 22:02 (UTC).